SamMobile has leaked yet another variant of the Samsung Galaxy S4. 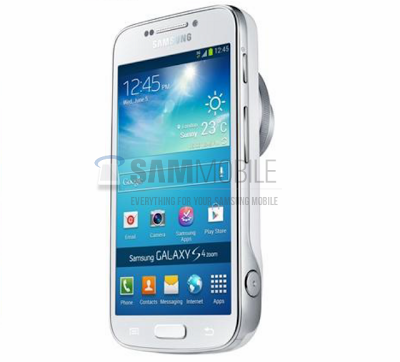 The Galaxy S4 Zoom is the the latest in the expansion of the S4 brand. Somewhat similar to the Galaxy Camera, the Zoom is more on the side of the a phone than a camera but is certainly better equipped than the cameras of competing phone. With a rumoured 16 megapixel camera with optical Zoom this is certainly one of the most promising looking cameras on a phone. The rest of the specs are very close to the Galaxy S4 Mini, 1.6GHz dual-core processor (Qualcomm Snapdragon S4 we suspect), 8GB of internal storage that can be supplemented by microSD card. June 20th is the expected announcement day.